Next week Mary Nelis, former Sinn Féin MLA and Derry City Councillor, begins a fortnightly column in An Phoblacht. Here she talks to ELLA O'DWYER about her political background, her family, experiences of struggle and 1981 Hunger Strike. Mary Nelis, former Sinn Féin MLA and Derry City Councillor is, as she put it: "only 71 years of age, with a lot left to do." She has already done a hell of a lot to address injustice in the Six Counties in relation to a range of issues such as poverty, housing, the demand for the vote for Catholics and the whole prison struggle. Three of Nelis's nine children have served time in jail as political prisoners. Her son Donnacha was jailed in the Blocks in 1976, John in 1978 and Frank was remanded to Crumlin Road Jail in 1990. Her eldest son Peter died tragically in a road accident. Years later, the grief of losing her son in a sense revisited her with the similarly premature deaths of the ten hunger strikers. 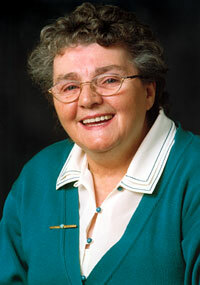 Mary Nelis was born in Derry in 1935. Her mother was a Donegal woman and her father came from the Waterside area of Derry. He had studied in the teacher trainer college in Drumcondra, Dublin, and often spoke about the events of 1916. Mary's aunt later expressed the view that he may have been involved in the IRA in Dublin. This is something that Mary has as yet been unable to confirm but again there is a family recollection of a man visiting their Derry home who family members believe may have been the Tipperary republican Dan Breen. Mary's mother was "apolitical and a pacifist." Nevertheless her experiences as a waitress in Derry at the time left their own indelible mark on her four children and particularly on her daughter Mary. Asked if she had always been interested in politics, Mary said: "You couldn't not have been aware. The account of the banquets my mother waited at really hit you at a time when we didn't know where the next bite was coming from." She left school at 14 years of age to start work in Derry's shirt factories. "I'd have loved to have continued in education but the opportunities weren't there. For a lot of young women at the time the only escape was marriage. There was no contraception and little or no employment for men. Women were the economic backbone." Later, as it turned out, women also became largely the political backbone and particularly around the time of the prison protests. But it was the campaign for housing that started Mary Nelis on her political path and she was a key player in the establishment of Tenants' Associations in Derry. Even after securing housing in the Creggan area there was still the matter of achieving the most fundamental amenities like shops, schools, crèches and even roads. This was how Nelis's community work progressed. "I wasn't too sure what I was doing; I was just meeting needs," she says. Pretty soon the pursuit of minor reforms was surpassed by the battle for equality and Nelis emerged onto the broader political platform. She was heavily involved in the Civil Rights Movement. Initially, Nelis and people like her sought very simple reforms from a sectarian state. The Civil Rights Movement challenged unionist discrimination and demanded voting rights at a time when voting rights were arranged around property. "If you had one bit of property you had one vote; if you had four bits of property you got four votes etc." The demand was for "one man, one vote". "We still hadn't got to the stage where we recognised our own rights as women." Mary was giving birth to one of her nine children, Kathy, during the Battle of the Bogside. When the British Army were sent into the Six Counties, it changed people like Mary Nelis irrevocably. "We weren't living in a ghetto but in a concentration camp, with checkpoints in and out, and soldiers raiding our homes. Young men and women were being arrested, interrogated, imprisoned or even shot. People euphemistically called it 'the troubles'. But it was a war." Mary remembers a time when the Creggan was nothing more than a British Army camp with houses raided every night. By 1976, when her son Donnacha was arrested, neighbours who would have rallied in support of the Tenants' Associations were now getting nervous. They were worried and afraid that raids and arrests would come to their own doors. Donnacha joined the blanket protest on his arrival in the H-Blocks and Mary became involved in mobilising around the prison issue. She and two other women went to the Bishop's house and stood outside in blankets to highlight the prisoners' plight. The Bishop was livid. "A man came across the road to where the women stood and took photos which appeared in the papers very soon afterwards." Mary got involved in the Relatives' Action Committee. "You went on the streets and you'd be beaten off or arrested. We travelled all over Ireland and protested in bare feet and blankets. We learnt about humility and about decency. You also learnt about hypocrisy in society." While the Committee met with a lot of support, they also met with the opposite. "I remember we were standing outside a church. I think it was in Kilkenny and the nuns came out with the children. When they saw us they put the children back into the church and closed the door. Then we were in Sligo another time, in the market square and the only person who came over to us was an old travelling woman. She came over and put ten pence into my hands. She thought we were destitute. She didn't understand that it was a political protest." Women like Mary Nelis and Bernadette McMullan, mother of POWs Jackie and Michael McMullan, travelled to Europe, the United States and England to highlight the prison issue at home. Of Bernadette McMullan she said: "Bernadette was a very strong woman. We took our campaign to anyone who would have us." Then came 1980 and the first hunger strike. "We thought we could resolve it if we campaigned hard enough. We threw ourselves into it." Mary recalled the snowy evening in Derry when she learnt that this hunger strike had ended. There was a phone call from Fr Denis Faul to that effect. "The news was greeted with a mixture of relief and joy for Raymond McCartney's family but there was an element of uncertainty and anxiety as it wasn't clear whether or not the five demands had been conceded." Soon enough it became clear that the prisoners had got nothing. On Fr Faul's involvement in the 1980 and '81 hunger strikes, Mary said: "It was as if Fr Faul had done a somersault overnight, as if someone had gotten to him. I could understand that as a priest he would want to see an end to the hunger strikes in order to prevent further loss of life. But then later he issued a letter to the paper urging people to inform on the IRA. That finished him for me." There was a kind of anti-climax at the ending of the first hunger strike and "it was very, very difficult trying to start the campaign up again. We were all exhausted but we got on with it." She spoke of the Trojan work done by women in her area, women like Kathleen Gallagher, Betty Anderson, Peggy Mellon and many, many others. In her personal contribution to Danny Morrison's recent publication Hunger Strike, Mary Nelis wrote: "Despite our efforts and the international condemnation of the British Government, we walked behind the coffins of the Hunger Strikers." Recalling the moment when she heard of Bobby Sands's death on the radio, she said: "The phone rang as I was listening to the news on the radio. It was someone ringing to say Bobby was dead. I could hear the sirens blaring outside and the commotion, but I couldn't move off the chair. I just cried. I hadn't cried in five years. It was as if it was my son who had died." It was after the hunger strikes that Mitchel McLaughlin asked her if she'd be interested in joining Sinn Féin. "It was the natural thing for me to do," she remarked. Nelis spent a week in Maghaberry jail during the late nineties on some fabricated charge, which was later dropped. The women POWs in the jail were delighted to have the company of someone who in many ways was a bit of an icon for republicans and especially for young women. Mary herself says she very much enjoyed the week with the women: "It was a bit of a rest in a way." Mary Nelis remains an icon within modern republicanism, though she herself reserves her admiration for those around her. Again in Morrison's Hunger Strike book, Nelis commented: "As I write this, I am in tears for all those who died, for the Hunger Strikers, for the prisoners who subsequently died as a result of the cruelty in the H-Blocks and not least for the members of the Relatives' Action Committees - those great women and men, most of whom had never been out of their homes - who took up the cause of justice on behalf of the prisoners." Twenty-five years on Mary Nelis, republican and great-grandmother, wants to take up the challenge cast by Sinn Féin president Gerry Adams at the August Hunger Strike rally in Casement Park to "face the future confident in ourselves and in our ability." Mary Nelis retired from her full time position as Sinn Féin MLA in 2004 when her husband Billy was injured in a car crash. But in reality it was more like a suspension or interruption and Mary is still full of energy and enthusiasm - only 71 - too young to retire. "I'd like to get back into things, to write more. There's a lot more to do."